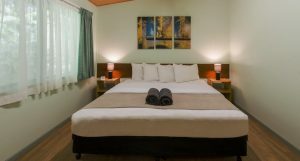 Chambers Wildlife Rainforest Lodges is hidden in 1200 acres of Lake Eacham’s lush, tropical highland rainforest in the beautiful Waterfalls and Crater Lakes district of the Atherton Tablelands. 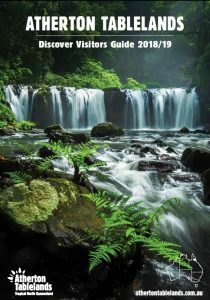 As pioneers in eco tourism our lodges specifically cater for birdwatchers, wildlife enthusiasts, naturalists, photographers, film crews and all those who want to have a true rainforest experience. Accommodation includes 10 fully self-contained 52sqm one bedroom lodges and a 108sqm five bedroom lodge. Under-cover swimming pool / large rainforest deck with sunlounges / 100sqm guest lounge with BBQ, pool table, wildlife library, high speed broadband internet – Free in room WIFI. The resort includes a 1.3km rainforest walking path to Platypus ponds, Brush Turkey mounds, and Tooth billed Bowerbird stages. A Wildlife Viewing Platform is illuminated until 11pm for guests to view Sugar Gliders, Striped Possums, Uromys, Bandicoots, Melomys, Antechinus. There are excellent restaurants, hotels, takeaways and supermarkets within a 10 minute drive of the Chambers.